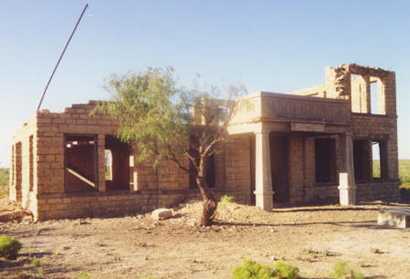 The remains of the 1911 Upton County Courthouse in Upland. On private land. Pieces of the old jail still stands. The first county seat of Upton County tried its best to comply with state law and located very near the county�s geographic center. It was granted a post office in 1907 and was platted the following year by Henry Halff. Upland was officially declared the county seat in May of 1910. With a centered county seat, a small but growing population, and even a newspaper, Upland�s future looked bright despite a severe lack of water and poor soil. Residents held out against nature, but it was progress that doomed the town. Upland joined the long list of ghost towns that were killed by being bypassed by the railroad. The year was 1911 and the population of Upland relocated to Rankin, even going so far as to move the hotel there in 1912. The newspaper moved to Rankin as well and although the post office held out for a few more years, it closed in 1918. 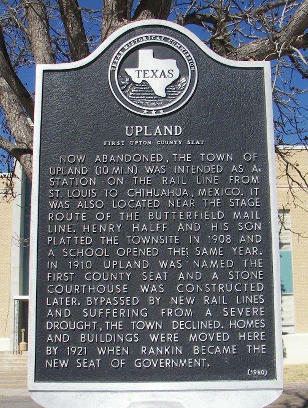 Today there is the historic marker in the Upton County Courthouse to serve as Upland�s tombstone. The name still appears on old maps and perhaps some faded postmarks on brittle envelopes in distant trunks. Texas Escapes, in its purpose to preserve historic, endangered and vanishing Texas, asks that anyone wishing to share their local history, stories, and vintage/historic/contemporary photos, please contact us.